It was another huge win for the New Order: Agents Throatslashar and iZaEaRl killed an illegal Mackinaw who was stealing ice from highsec. 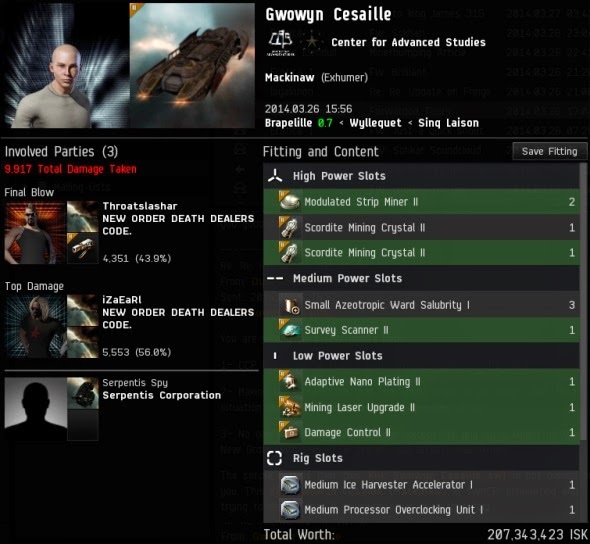 The criminal in question was Gwowyn Cesaille. He wasn't fooling anyone with his almost-tanked ship. If you're going to sacrifice tank in favor of yield and bot-aspirancy, you might as well own it and go all the way. On second thought, don't do that. Gwowyn was alarmed when he discovered that other spaceships were shooting at his spaceship. That wasn't what he signed up for. Highsec is supposed to be about spaceships shooting at rocks and chunks of ice, he thought. But even if that were true, you could argue that our Agents were shooting at the chunks of ice contained in his Mackinaw's ore bay. 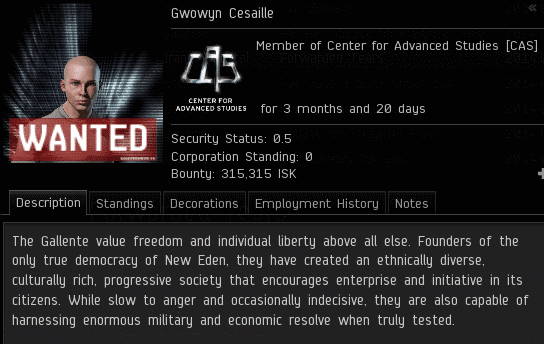 Disgusted by the whole "PvP" thing, Gwowyn became enraged and started spouting threats at the Agents in local. Our heroes directed the matter to Agent Durandi Ghostal. Durandi instantly became a mentor to Gwowyn. Within seconds, he dashed off a few sentences that taught Gwowyn more about EVE than the tutorial ever did. A denialist! Gwowyn refused to accept the existence of the Code. If that's true, then what has everyone in highsec been reading lately? The carebear also claimed that Durandi was playing the game wrong. That's absurd. EVE is a sandbox. Besides, Gwowyn was the one playing the game wrong. Durandi is an old hand at compliance management. The whole "there is no Code" routine didn't fool him for a minute. He even had the URL for the Code, thank goodness. Can you imagine how difficult it must have been to win arguments before the internet was created? The rebel miner was forced to concede the existence of the Code, but then he questioned whether it was a "justifiable" Code. Dr. Cesaille then diagnosed Durandi as a sociopath. Durandi hadn't even fired on his Mackinaw; he'd simply advised him to follow the Code. That's what passes for sociopathy these days? I'm sure the bar used to be much higher. Durandi tried to reason with the wayward miner. Clearly he was an anarchist. But Gwowyn spontaneously jumped from anarchism to legalism. He accused Durandi--either based on his EVEmails or his association with gankers--of violating American law. He didn't specify which law had been broken, though. Perhaps shooting his spaceship was harassment? 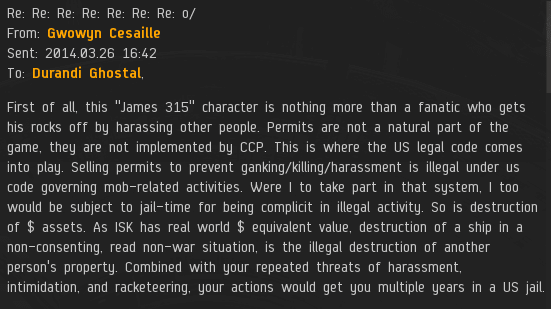 If so, the nullsec alliances should look into "legal tanking" to protect their fleets. Interestingly, Gwowyn claimed that if miners had drawn up the Code, then it would have legal grounds. Durandi became fascinated by the carebear. If given the opportunity, would he take his space-lawyering to the next level? If only Babatunde B Babatunde were still around, Gwowyn would've made him proud. For the first time, a miner claimed that he himself could be sent to prison in real life for buying a mining permit! 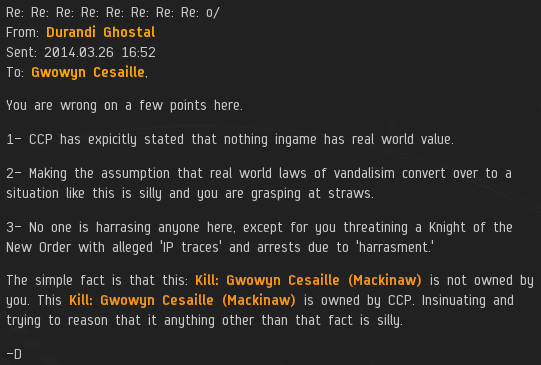 Gwowyn took it even further than that: Anyone who destroys an internet spaceship outside the context of a wardec can be sent to prison. For multiple years. Now we know why America has such a large prison population. Durandi continued dispensing facts, but let's face it: The feds were already on his heels. Gwowyn Cesaille, the very picture of mental health, decided there was no point in talking to a crazy person, especially one whose mining permits could land her in the Big House. I've got a piece of advice for those of you who do end up going to prison, though: Try to get in with the people who were sent to prison for selling mining permits, not the ones who got jailed for buying them. You can never count on a carebear to have your back. Nice follow up to yesterday. The World still turns, miners still get blown up, The Code still reigns supreme and the miners still claim everything that is wrong about the game is not them. Well said! But all my donations and shares bought will be in Erotica's name. How does US law even apply to an Icelandic MMO ? US law applies in the US, even for online content. CCP have an Atlanta office. In reality this would never progress far at all, but just because anyone can be sued or held accountable in the US under US law even if you never intend to go there. Thats not unique to the US either. Its true of many countries. If CCP starts getting sued their strategy should be to vigorously and always move to fine plaintiff's council for filing a frivolous suit and always ask the judge to write an ethics complaint to the state bar. You thought was erotica1 did was alright, so you obviously don't even have the smallest clue what "sociopath" could mean. But the majority of the EvE community thinks otherwise, than you and you little crew of dimwhits think. erotica 1 is banned, that should ring some bells for you. Oh and after giving so much support to a case of a sociopathic player, its clear to the community that you are not much different then him. Jimmy, I'm sorry for what I posted above. Thinking sbout it more, I didn't mean any of it. Long live you guys. It's the non Code-compliant community that are at issue. I'll go and buy a mining permit right now as an apology for my outburst. Nice try "AnonymousMarch 29, 2014 at 11:06 PM". But i like the idea: YOU buy permits and leave the beginners alone? He Jimmy buy permits with eroticas money and send permits to every miner to show good faith? The majority of the Eve community who denounced Ero has never listened to the Sohkar bonus room, and simply raged the way Ripard told them to rage. He's the biggest scammer and social engineer of the lot. I'm sorry ya'll, I keep having these terrible mood swings :( - I didn't mean what I responded to myself there earlier. I do truly understand the importance of The Code and the great potential for High Sec when it eventually comes about to 100% compliance. I'm going to go get my permit for real this time. "The majority of the Eve community who denounced Ero has never listened to the Sohkar bonus room"
Go count number of posts denouncing Ero 1 on Eve-O boards. Then look at the page views of the soundcloud recording. Then subtract about 1/3 of those page views as peoples' female relatives listening to the track. Putting the guy into a "watchlist" makes further interaction into harrasment. Not sure if you are serious or not. "The carebear also claimed that Durandi was playing the game wrong. That's absurd. EVE is a sandbox. Besides, Gwowyn was the one playing the game wrong." Whoever James really is, he owes me a keyboard. Sweet isn't it? I bet Jimmy didn't even realize how stupid it is what he wrote. Hmm maybe Jimmy is distracted, since he can hear the bells ringing, realizing one what thin ice he and his dimwhits are walking. Actually I'm sorry guys, I didn't mean what I wrote earlier. The New Order Agents are not dimwits, and they're not walking on thin ice. I'm truly sorry for my misbehavior. I now realize that the New Order's goals are noble, and I will buy a permit and give the Agents the respect they deserve. Shooting spaceships is now illegal in the US. Every time someone tells me something like "carebears don't want to ruin your game, we just want to play ours", I just visit this website. No the majority of Jimmies followers are not top notch. Mentally handicapped with major flaws in the social compartment. And they are slow learners: There is no point crying over e1, he is gone. Obviously many of them have not realised yet, that their position in EvE is quite endangered. Bad fit or not, the Code still needs to be enforced. 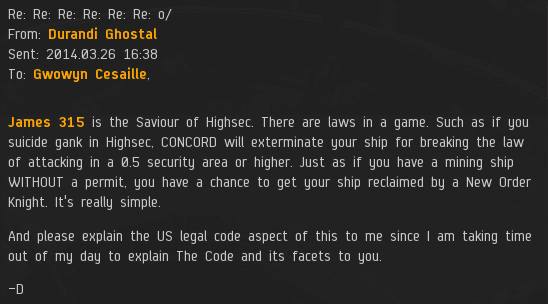 It's a tough job but the New Order will not rest until High Sec is safe. You should be cheering us on, methinks you are clutching at straws here to find a negative reason to post here. This was actually really bad James 315. Way off of your normal level. Claims of threats yet none posted, only one little ship was destroyed, the agent & miner convo's are intensely boring with a distinct lack of tears or rage. Has something happened that has put you off your game James 315? James????
" A denialist! Gwowyn refused to accept the existence of the Code. If that's true, then what has everyone in highsec been reading lately? The carebear also claimed that Durandi was playing the game wrong. That's absurd. EVE is a sandbox. Besides, Gwowyn was the one playing the game wrong." Contradicting your self aren't you? Nobody is playing the game wrong, if Setting up your ship for higher yield while still attempting to have a little tank there is nothing wrong. -- " A denialist! Gwowyn refused to accept the existence of the Code. If that's true, then what has everyone in highsec been reading lately? The carebear also claimed that Durandi was playing the game wrong. That's absurd. EVE is a sandbox. Besides, Gwowyn was the one playing the game wrong." Sarcasm, its not your strong suit is it there Anonymous 9:02 AM? Maybe Facetious is a better word, but I don't want to go right over your head too many times in one day, you're struggling with reading comprehension as it is. Arguably any law regulating how people play a game would be an absolutely barred violation of the first amendment because any such law by definition would not be content-neutral, i.e. it would discriminate in favor or against some kinds of expression based solely on their content. But I only have a doctorate in jurisprudence accredited in the U.S. by the American Bar Association - what do I know. It is a sandbox, but emergent gameplayers know that Bot aspirancy is the wrong way to play. That's right! Bots are not only bad, they're illegal! Why do you want to play like an illegal bot? How is that anything other than wrong? And RPing indignation and entitlement to play in a theme park isn't emergent gameplay, it's just pathetic. Note that I assume the bears are RPing their indignation, as I am generous like that. 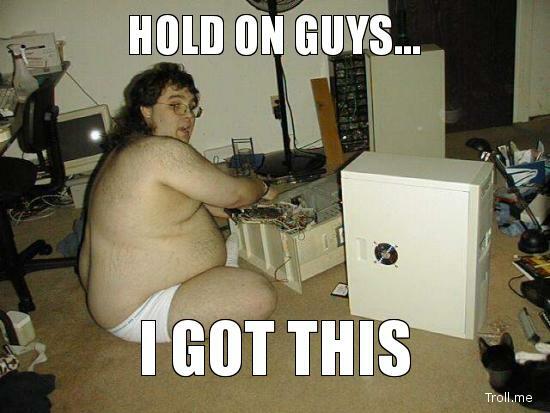 If they aren't RPing, then I just pity them.